The bridge is the only lifeline for the residents of more than two dozen villages by connecting Hussainiwala enclave with the rest of the country, the minister said. Defence Minister inaugurated a strategically important bridge yesterday. 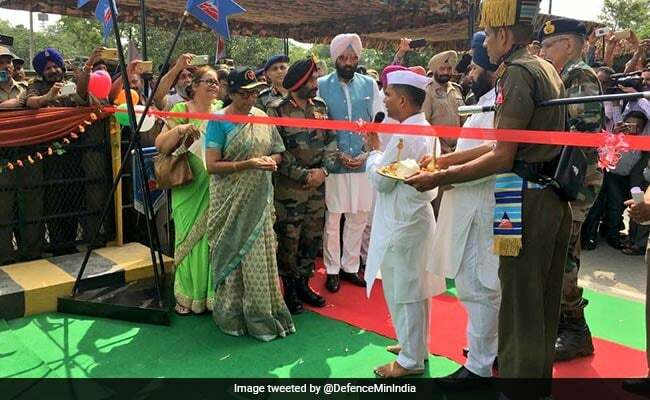 Defence Minister Nirmala Sitharaman inaugurated yesterday a strategically important bridge in Hussainiwala, which was was blown off during the 1971 Indo-Pakistan war to stop advance of enemy force's armoured units. After dedicating the 280-foot-long bridge to the nation, she said it connects Ferozepur with Hussainiwala barrage on the Sutlej river. During the 1971 Indo-Pakistan war, four spans of the bridge were demolished on the intervening night of December 3 and 4 to stop advance of enemy force's armoured units. After the war, a bailey bridge was built by the Army to restore road traffic. To replace this temporary 280-foot-long bailey bridge, construction of a permanent 82.40 metre bridge was entrusted to the Border Roads Organisation (BRO) in 2015. To enable construction and continuous passage of traffic, a temporary diversion bailey bridge was built by formation engineers in September 2016. On the occasion, Ms Sitharaman said Hussainiwala belongs to freedom fighters Bhagat Singh, Rajguru and Sukhdev who made prime sacrifices for their motherland, which the whole nation can never forget. The minister said the soldiers should consider themselves lucky that God has given them an opportunity to perform their duty in such a sacred place. "I expect that everyone will perform their duties with zeal and courage, and will not allow the enemy to seize even a single inch of the motherland," she said. The Defence Minister was accompanied by Punjab Sports Minister Rana Gurmit Singh Sodhi and senior army officials including Lt Gen. Harpal Singh, Director General of Border Roads Organisation Lt Gen. Surinder Singh, Army Commander of Western Command Lt Gen Dushyant Singh. She also interacted with various regiments of Western Command.